MARK4 Christmas Tree farm has grown White pine, Scotch pine, Leyland and Murray cypress, Norway Spruce, Blue Ice and Canaan Fir trees for 25 years. 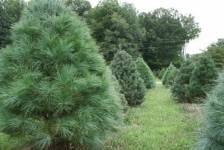 We also have precut Fraser fir which are kept watered to ensure freshness. We cut for you or provide saws for your use. A shaker is used to remove loose needles and trees are baled/netted. We also sell Wreaths, tree stands and other Christmas items. The farm is located at 535 Kinniard Road, Cookeville TN 38501. Exit I-40 at exit 286 go north 5.3 miles, turn right on Kinniard, farm on left. The 2017 selection is mostly White pine, Scotch pine and Blue ice (Arizona cypress) along with the Fraser firs.